The MacJet is a full reflex paramotoring glider that offers high speed and stability. 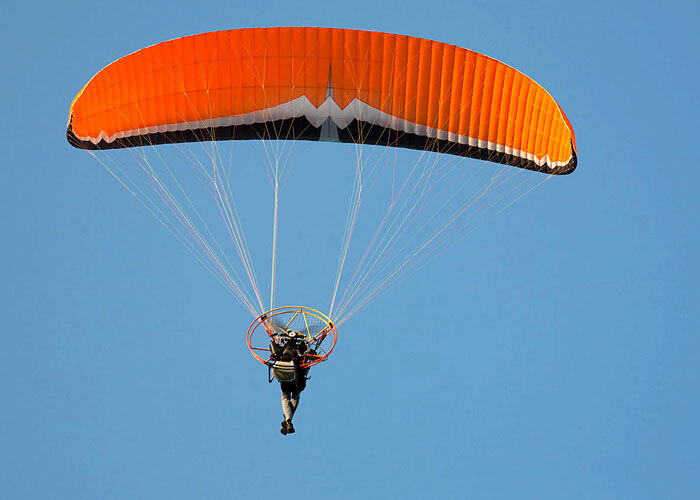 It was designed for advanced paramotoring pilots looking for an easy to use glider with a wide speed range. Even though it is a reflex glider, pilots will appreciate that it still has the same safety and performance found in a classic MacPara paraglider. 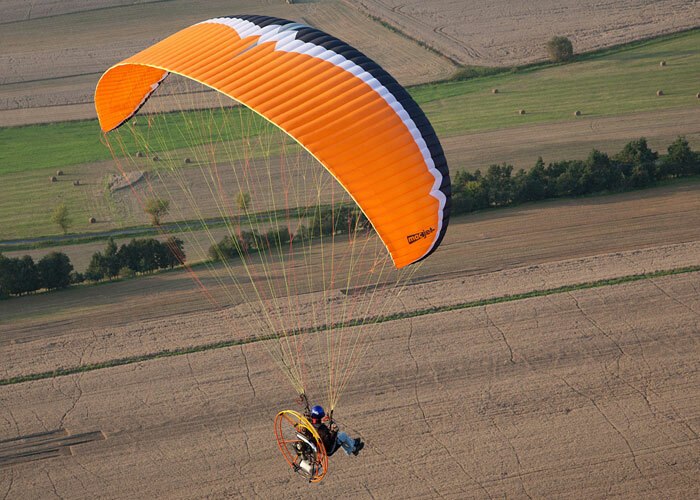 The MacJet flies faster than all other MacPara paragliders and offers excellent maneuverability. The MacJet customized reflex airfoils enables you to fly with no surprises and is resistant to collapse even in rough air. It features excellent stability throughout the full weight and speed range. Managing the angle and radius of the turn is effortless despite its high reflex performance. The canopy is moderately damped in all axes and offers flexibility and agility in turns. It does not overshoot or sit back. Excellent launching and landing characteristics are typical of all MacPara gliders. The MacJet is no different. These characteristic offers the pilot safe easy take offs and landings in no wind conditions even when heavily loaded. The brake pressure is light and the turns are pleasant when the trimmers are in their closed position. When they are fully released (glider accelerated) the brake pressure increases rapidly. That is why the long trimmers and the wing tip steering kit have been included into the design. The canopy has an aspect ratio of 5.23 and is fitted with new MacPara design. The MacJet has 58 cells with diagonal segments. Lines are attached to every second and the lines are divided to three tiers. The MacJet is equipped with rear-riser trimmers with a long range for decelerating (6 cm) and accelerating (12 cm) of the glider. The risers include split A’s to facilitate Big Ears, a wing tip steering kit for accelerated flight and a torque compensator. You will notice great attention to small details on the MacJet. It is equipped with especially thin brake handles with magnets making them more comfortable to hold during flight. The brake handles are also fitted with swivels and additional loops for steering use during long flights. With the addition of strong magnets on the brake handles, placing the handles on the risers in flight or during take-off preparation is much easier. Velcro closures on the wingtips make access easier to remove any sand, grass or small stones from the glider. 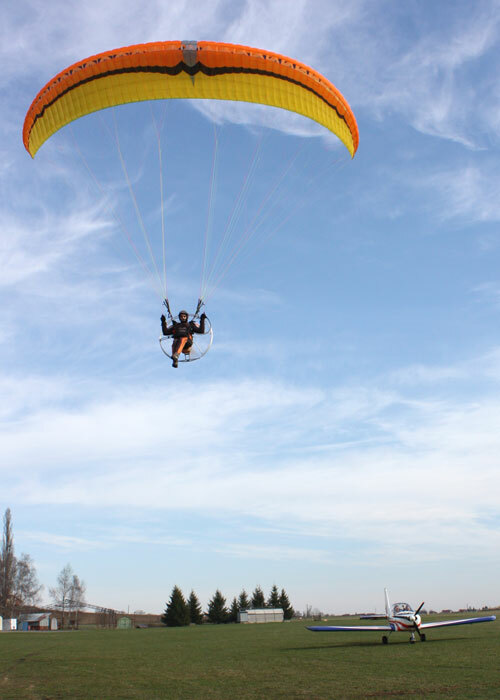 Like all MacPara paragliders, the use of high-quality materials and constant quality control measures throughout the manufacturing process are evident. The MacJet is available in five sizes and covering a total weight range of 77 kg to 180 kg. Please check the specifications for full details to best suit your hook in weight. 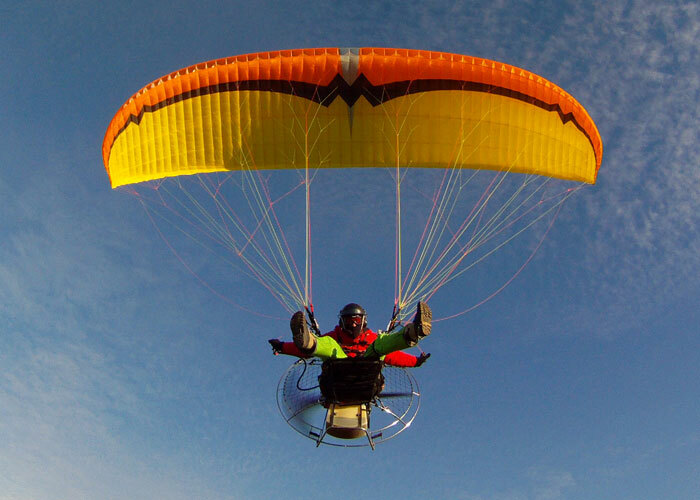 It took Mac Para some time to enter the arena of gliders with reflex profile, after several years of popularity of their "easy" gliders for paramotor (non-reflex) like the Eden series, but it was worth waiting. 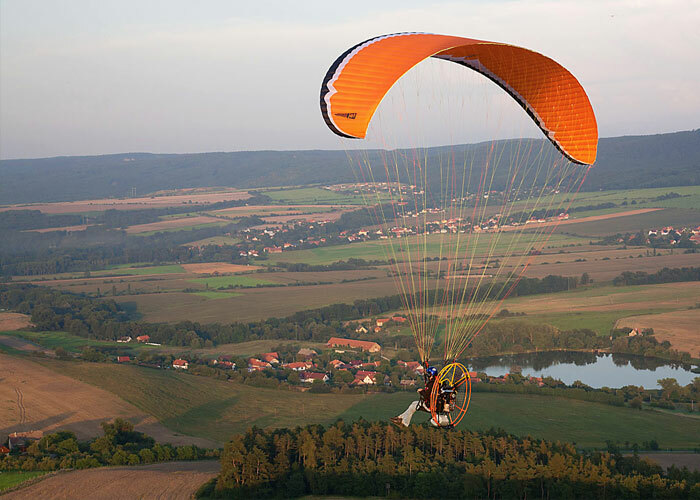 The proposal of the Czech factory for the group of advanced paramotor gliders has a sophisticated manufacture and, above all, an attractive personality of flight. The MacJet is extremely agile, quite fast and very stable; it resists turbulence well and transmits confidence to the expert pilot offering unusual handling and manoeuvrability for a reflex glider. The MacJet is the latest addition to Mac Para’s range of PPG wings, where we also find the "semi-reflex" Velvet or the Spice that have been our for more than two seasons already, and the "power" versions of the easy models Progress, Muse 2 or Eden 4. 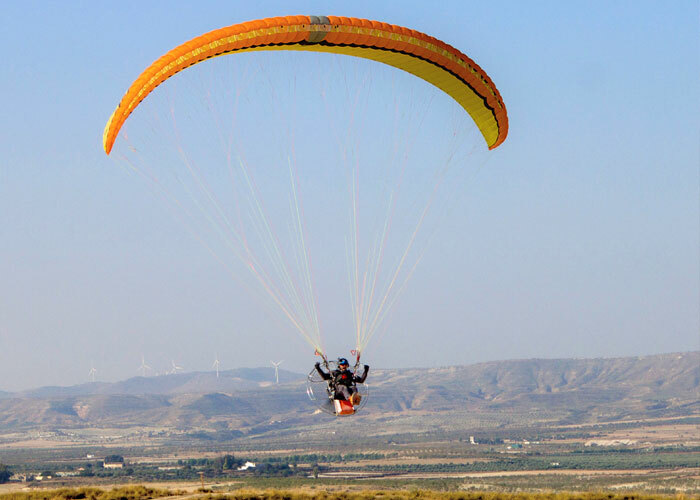 In other words, the manufacturer is not new to the world of powered paragliding, and with 20 years of experience making paragliders we could only expect them to release a good product in this new reflex glider aimed at experienced paramotorists. Smooth as silk; seriously, the Macjet has its first virtue in the inflation. The canopy fills with air on a uniform way, requires little input on the risers and tends to climb by the centre. Even if we pull it a little "asymmetrically" the glider takes air on the middle and does not tend to fall on the sides; even the airflow from the propeller seems to affect it very little. Only advantages for those who don't want to fail a take-off, the wing rises progressively and with no tendency to overshoot. For very short takeoffs you can close the trimmer but it’s better to let the wing fly, and close a couple of centimetres from the neutral position at the most. In general, I did most of my take-offs in neutral position. The handling of the glider is nice but it feels a little strange at first as the first 5 cm of brake travel (approximately) have no pressure; this is necessary to ensure that the brakes are not working when you are gliding with fully open reflex. When the brakes start acting you immediately notice the pressure. The usable travel is at around 35 cm, the input is somewhat hard and the response, direct. The MacJet turns as a whole and, despite having an aspect ratio of 5.23, it has a turning radius that can be very closed. The handling is smooth and balanced, with the new Mac Para reflex wing you have some room to fix the turns since it maintains a large reserve of energy; this is good when you don’t have power to spare as it allows you to "keep" the intensity of the turn using this energy with the brakes if you start sinking more than expected. In ability tasks, if you turn with the trimmer fully closed the resulting turns tend to be very closed but with a tendency to climb. It is better to fly with the trimmers half open, so that you keep nearly all the brake control but flying at a speed close to 50 km/h. Then you’ll have a lot of energy to spend horizontally; besides, if you're a skilled pilot you can even use the speedbar on the straight courses to counteract the climb and gain speed. Mac Para incorporated two small handles in the MacJet, additional to the brakes, attached with elastic bands. These controls brake the tips of the wing and although they are mainly intended for use when we glide at speedbar and/or with the reflex open, they can also be adjusted to be used together with the normal brakes. This way you can control the glider when flying in reflex mode, as the input has very little effect on the centre of the trailing edge and much more towards the wingtip. They work well and you manage to turn with little effort and control travel. Mac Para introduced a simple trimmer-like system to counteract the torque effect of the motor on the MacJet, consisting of a rubber cylinder through which the wingtip line is passed; this line has several knots that we can fit into the rubber in order to keep one wingtip pulled and thus balance the engine torque (that makes the glider turn to the opposite side of the propeller rotation). Both risers have this simple addition so you can fly your MacJet with different paramotors no matter if the propeller turns clockwise or anti-clockwise. Prior considerations: I flew the MacJet size 28 (28,44 m2) using my Airfer C1 DC paratrike fitted with a Bailey 4V200 engine of 22HP and about 68-70 kg of thrust. The recommended weight range for this size of glider is 115 to 147 kg; I did my test flights with a load of 152 kg, i.e., with a wing load of 5.34 kg per square metre: a bit over the recommended top weight. I did the tests of speed early in the morning in very light or nil wind, flying an out and return course, face wind first and then with tail wind to get an average speed from the two readings. The MacJet trimmers have a deceleration range of 6 cm and 12 cm of acceleration. With closed trimmers I could keep a speed of 43 - 45 km/h with a relatively low effort of the engine; if I put some pressure on the brakes I cruised at around 36 - 38 km/h with the best sink rate and an effortless thrust from the motor. This position is ideal for economy navigation tasks. The neutral trimmer position is marked with a white line on the risers and it is the position where the risers are levelled; this is the more interesting configuration for navigations and also for precision ground tasks like the Cloverleaf or the Eight. The MacJet maintains all the brake control, turns very well, and restores plenty of energy flying at 50 km/h, and it just requires a little more RPM than with closed trimmers! This is the position recommended by the manufacturer for using the speed system. With the trimmer fully open you reach 54 km/h; the brakes harden and then it is advisable to steer with the auxiliary controls. In this configuration the glider is solid as a rock. I got the maximum speed from the MacJet with trimmers in neutral and stepping on the speedbar until the pulleys were touching each other. I found the bar a little hard but the speed gain is more than noticeable, going from 50 to 68 Km/h! The Macjet risers come with a warning about opening the trimmer and using the speedbar at the same time. After asking the manufacturer, they explained me that with the factory settings of the Macjet, if we release the trimmer and push the speed bar it may happen that we don’t fully release the brakes (hands all up) and therefore lose the reflex (autostable) airfoil. This might happen when flying high hangpoint paramotors too. Such situation can cause the glider to have different reactions at full speed, being more vulnerable to collapses for example, an also it would be more difficult to recover in case of an incidence. Therefore, in order to test the speed performance with speed bar in full reflex mode I would need to lengthen the brakes at least about 10 cm first. I believe that in the future, and for personal curiosity, I will carry out these modifications to check if it is possible to fly the Macjet up to 70 km/h. Finally, after having tried many of the best current reflex wings, I think the Macjet has one of the best compromises between speeds and sink rate. The Macjet has not been certified; in fact, we still don’t have a specific certification for reflex gliders. Regarding durability and materials, Mac Para has an impeccable track record and their equipments are manufactured with first line components, so we should not have concerns here. In my test flights I checked that the reflex works and that the glider keeps a high stability in flight; I never found myself in any compromised situation or critical aspect regarding security. About my "sensations", I’d say that with the trimmers closed the Macjet responds similarly to any current intermediate glider, i.e., it requires some active piloting. Wing responses are easy to control and, in general, I think that in the right hands this paraglider will not give any trouble. The only thing that caught my attention, as I already mentioned, was the warning on the riser recommending not using the trimmer and speedbar at the same time. Mario Mendoza - 8 years flying, Club Paramotores Bajo Guadalquivir. “I tried the size 26 and I liked it very much, but I finally chose the small size of 24 m2. The MacJet inflates very well: I have no previous experience with reflex gliders but I think this glider inflates and launches well in zero wind and also with strong wind. I don't use the speed bar, only the trimmers, and one day with 15 km of tail wind I did 64 km/h. In harsh conditions it moves somewhat abruptly but it is very stable and I have noticed that when you release the trimmers it is best not to touch the brakes, you can keep the course with the auxiliary controls. If the trimmers are closed it turns like a free flight glider. I have about 6 hours of flight with it and so far I am very appy. It's a fun glider but requires active steering”. Javier Hernández - 5 years flying, Club Locosxvolar. "I think it's a very good glider, it has a very easy inflation for a reflex wing, it comes up finely and you gain some 5-6 meters that allow you to be in the air earlier. In flight it keeps good pressure, the brakes are long and help you dose your turns precisely; the handling is good even with half trimmer open. The turn is what I liked the most; in general the turns are good and well rounded. Regarding speed it goes like most reflex wings. For me, it is a very safe and stable glider, I think that even a beginner could fly it. In level flight it is very solid and stable, it does not move or pitch much and the torque effect is barely noticeable. Only thing is that the auxiliary controls are a little high for me. The glide ratio is ok for a reflex glider but I think it is its weakest point". 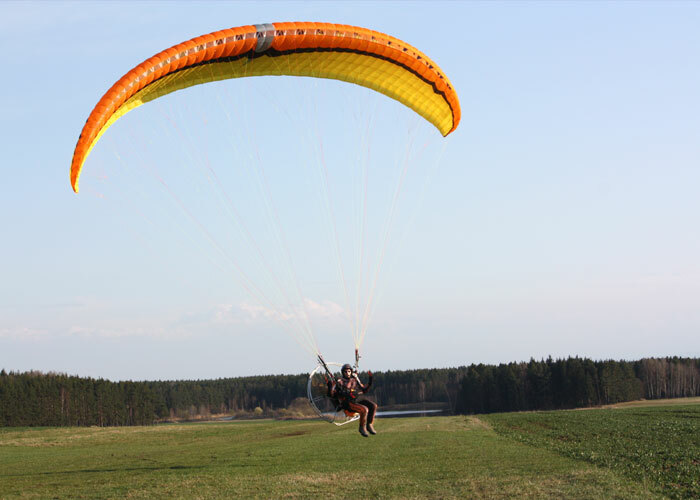 The MacJet is manufactured using the paragliding industries well established lightweight material with excellent durability; Skytex 40, from Porcher Sport (NCV). Because for any glider, the part that always wears out first is the leading edge, we use Skytex 45 with evolution coating E85A for this. For the less stressed areas of the sail we use Skytex 40 with E38A coating. For the supporting and diagonal ribs we use Skytex 40 with “hard finish” coating E29A. This gives the advantage of a sail that is both lightweight and very durable.